It gave me a chance to reflect on why I started this blog in the first place. 1. It just started out as a hobby. Back in 2008 I had a job working in a cubicle and was experiencing the workplace for the first time. Around that time was the beginning of the unending press about millennials. A lot of the coverage was fairly negative. But truthfully, I just had a blog on Blogspot, where I had random musings about whatever I wanted. It was way too broad. I wrote a post about millennials, and decided that would be a good focus for ongoing musings. In 2011, I switched over to WordPress, and changed it to So-Called Millennial. Ta-da!! Remember back in 2000 when we did group circle selfies with digital cameras? 2. I first learned about millennials in high school. I remember my mom mentioning something about Boomerang Kids a long time ago. In the late-90s, there was a rise in 20-somethings moving back in with their parents after college. About 15 years later they still won’t leave! My older brother actually ended up living at home during his early to mid-twenties like many millennials. I also had completely forgotten about this, but my boyfriend in high school was part of an ongoing feature in the local paper that followed the stories of students starting in 6th grade until high school graduation. He was two years older than me, so born in 1982, and the feature highlighted the new millennial generation! I was self-aware about “being a millennial” starting at a young age, and I guess I’ve noticed it on some level since high school. 3. Many media outlets put millennials in a bad light. This is probably the main reason millennial bloggers speak out. There are a lot of exaggerated stereotypes, and broad-stroking of this generation. I’m not interested in defending millennials, as much as sharpening the arguments. I’m fine with millennials being insulted (or praised) as long as it’s accurate. Please insult me correctly! 4. The cultural shifts are fascinating. This is what brings me the most inspiration in musing about millennials. I don’t care how awesome or horrible we are, I care that across the board we’re all facing many changing realities, social crises, changing attitudes, and new tools. Sorry, that was a mouthful. Changing realities— internet platforms, and social media are changing the game. Social crises— race, poverty, bad business, [insert your cause here]. Changing attitudes— we just don’t care about a lot of the things previous generation value. No matter how cool those jeans are, if they are too expensive we won’t buy them (unless you give us money). New tools– there is an app for all of your problems. In a recent discussion with another millennial writer we concluded: “the old rules don’t apply anymore.” And we’re trying to sort it all out. 5. We’re big and important. We’re reaaally big. Like a gazillion or 75 million or something. And we’ll be powerful. It seems like we need to figure out what we’re doing. 6. The generational cycles theory by Howe & Strauss. 7. Marketers were doing either a really good job or a really horrible job at reaching millennials. This is still an issue at times, though marketers have done a better job at understanding this demographic in the last few years. I used to notice strategies that seemed to glide right over the heads of millennials. Many brands failed to recognize millennial values: millennials are pretty pragmatic at the end of the day, and prefer authenticity. “Just talk like people.”They were using the wrong channels to reach them: brand engagement is better than mass marketing. OK, we’ll start solving problems. 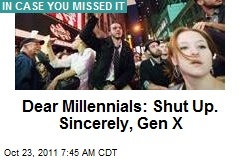 The mic is all yours, GenXer who wrote this. 8. On a lesser note, some GenXers HATE millennials. I wrote a response to Jeff Gordinier’s rant against millennials a few years ago. Many of the assessments of millennials were hypocritical, and much more accurate of GenX. Like I already pointed out, I don’t think millennials are above criticism, but the stones older generations are throwing at them are usually much more accurate of their own generation. 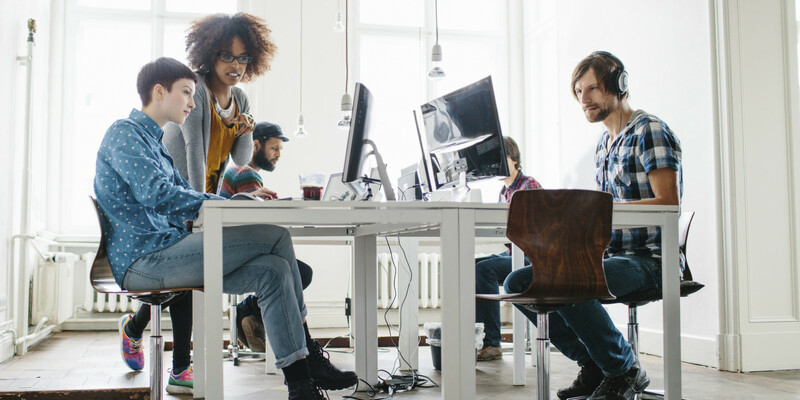 A while ago I heard a GenX consultant who helps other GenXers adapt to the workplace sandwiched between Boomers and millennials. He said that GenXers have a tendency to relate their experiences with millennials: 9/11 was just a millennial version of Challenger. The Financial Crisis was their version of the 1990s dot-com bubble. He said this “relating” actually alienates rather than relates with millennials. I agree with his observation. So since there has been so much ranting from this group toward millennials, here’s a short one of mine: We were encouraged and praised by our teachers and parents growing up (coddled? ), raised with goals in mind, which has made us ambitious (entitled? ), and handed over poor circumstances, so our “whining” is actually relevant. So to the anti-millennial GenXers: When you insult us, at least get it right, you neglected, irrelevant, cynical, superficial McMansion-owning, dial-up-internet stone age, latch-key kids! I hate ranting by the way. Oh, and I like (and sometimes love) most GenXers I have the privilege of knowing. Basically I started writing to get a deeper conversation going. Instead of hashtagging them to death as #saviors or #theendofallthingsgood, and try to get a better idea of who they are and why. Millennials are an interesting group. I’m happy to keep observing them, and hashing out the interesting twists and turns they make in our society to help us better understand this generation. Or group of spoiled brats/heroes of America! Whatever you prefer to call them. Keep reading and sharing. Thanks!